Vermont to Maryland – Why is the Sky so Dark? A dash east to escape the heat! November 3rd, 2015. In the past two weeks the cancer has taken a much more aggressive note. His cervical lymph nodes are so large he has trouble swallowing. His lungs and liver are involved and his serum calcium level is dangerously high. Our fantastic vet says he has another week or so, with his quality of life declining day by day. I cannot ask such a wonderful companion to endure that for my sake, as much as it pains me. Sometimes the most loving gift of all is finding the courage to let go. I promise each pup that shares my world a life filled with love and adventure. With Tetley and Tadcaster I was able to meet only half of that promise; they passed far too soon. But I take some comfort in the fact that with Barley I was able to fulfill that promise, to give him a life of the sort other dogs could never even dream of. In over 55,000 miles of shared adventure covering 36 states and six Canadian provinces, he has played in the surf of two oceans, swam in all five Great Lakes, hunted along the shores of most of the major American rivers and scores of lesser ones, peed two miles up in the Rockies, chewed on the fibrous bark of a redwood, attended several BMW motorcycle rallies and made hundreds of friends along the way. He has been, in every respect, a remarkable dog. Give me five more minutes, Dad. I can almost taste that mouse! We spent all day together, he and I. We went for a short sidecar ride, his last, and I marveled at how it seemed to brighten his spirits. We said goodbye to old friends, brought smiles to the faces of Sterling College students we passed, and visited shops known to keep treats behind the counter. He always trusted me to do the right thing. As I looked into those big brown eyes I knew it was time to let go. He hunted mice and managed to kill one more. But mostly we sat together enjoying the warmth of the sunlight on our faces, the warmth of our bodies as we leaned into each other. He shared with me in his usual vocal way how much he enjoyed our years together. He made sure I understood that should I not regift the love he has given me over the years he will be royally pissed at me. 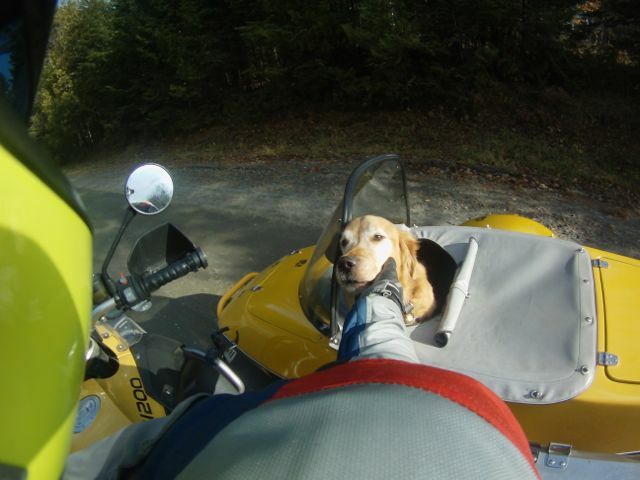 He reminded me to be patient with Tulliver, that it took us years to become a sidecar team and that Tulliver is just learning the ropes of Adventure Doghood. Are you feeling okay, Dad? Your eyes are leaking. At the hospital we lay down together on the dog bed. He draped one paw over my arm, possessively, the way he always did. He panted. He licked the tears from my cheek. He shifted uncomfortably from the pressure of his distended abdomen. But still he wagged, still he pressed his muzzle to my throat and made happy sounds. My Soul Dog, my Adventure Dog, left this world with his wag and his dignity intact. 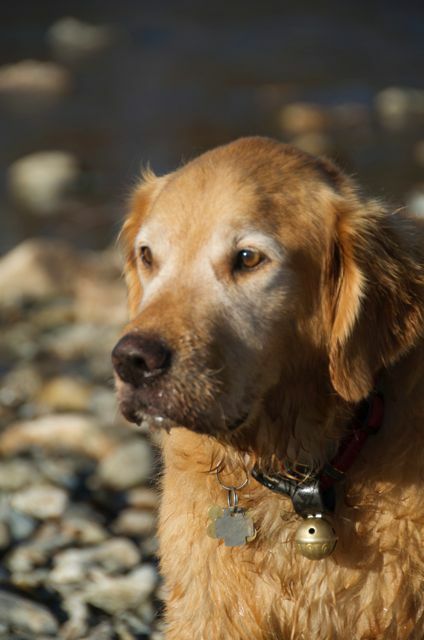 The Golden Retriever Lifetime Study, managed by the Morris Animal Foundation, is a robust and well-designed study that is following three thousand golden retrievers from birth to the end of life, generating tremendous amounts of data to help researchers understand, and hopefully overcome, the cancers that have taken so many cherished dogs far too soon. Clicking the GRLS link below will take you to the study’s home page. Read it. Follow the links. 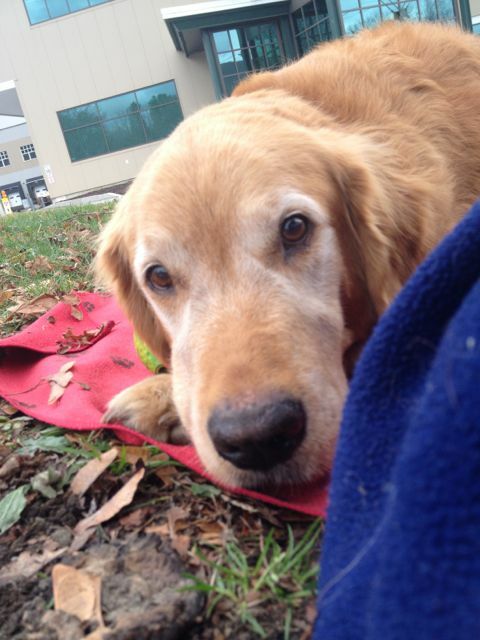 If Barley’s story touched you, or if you have ever loved a dog, please donate to support research into canine cancer! Its the toughest of times, a time that I have endured on too many occasions with mans best friend, but like myself you’ll be happy knowing that that best friend was given a life of a king. The adventure riders of the world will miss Barley and I’m sad for never having the chance to meet him. May he have an eternity of fun filled mice hunts and all his heart desires. 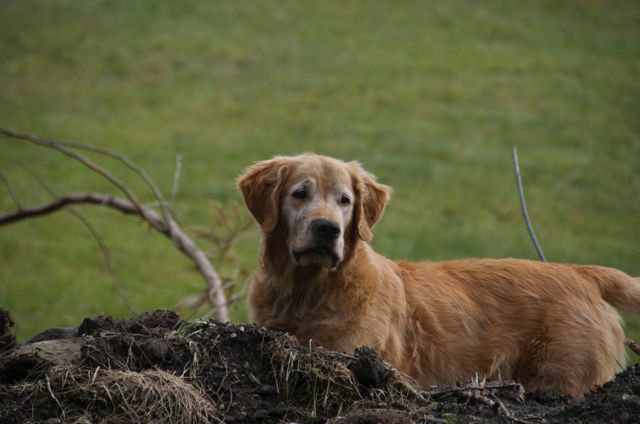 What an amazing and heartful tribute to your beloved dog Barley. The greatest gift you have given him is the gift of letting him go and run again in the peace of heaven. I hope you find peace with his passing. What an amazing life you gave him. I’m so very sorry to hear this. Our beloved companions are gone far too soon. Bless you for giving him a wonderful life. Prayers & hugs. My last two I list way to young. You will see him at the Bridge one day. God blwss. This is a wonderful site to a precious golden. 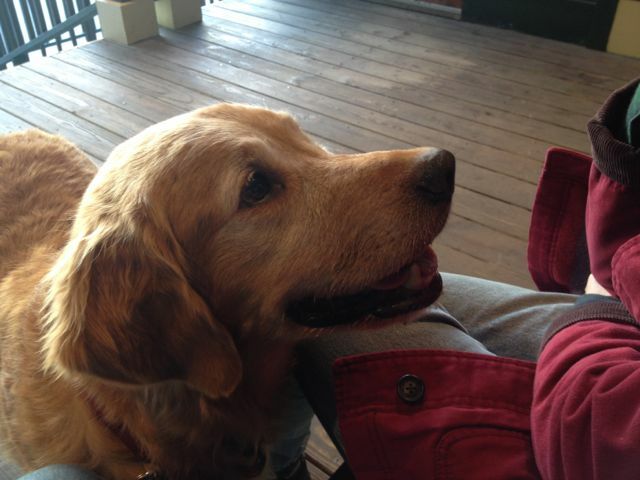 Barley and you have shown the true meaning of love between a man and is golden. Wonderful tribute to Barley. He lived a great life. You must write his story, it’s that good. How do I follow your blog? How wonderful for Barley that he shared his life with you. Your love for him is in every word and adventure you shared. I am sorry for your loss and happy that you two had such a wonderful life together. 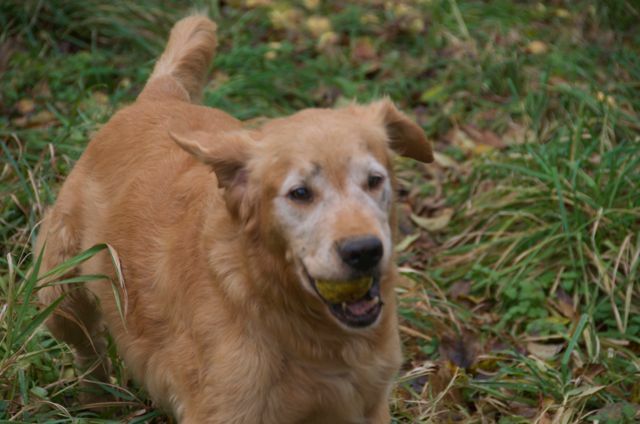 Run free and play with the angels, Barley. My eyes are leaking as well from reading this. 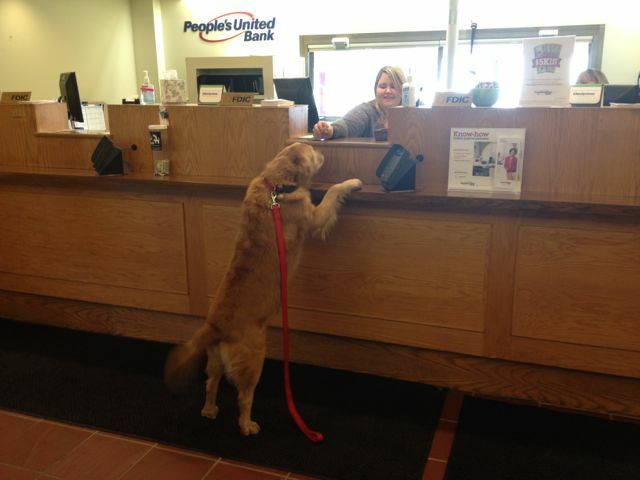 I wish that I could have met Barley. He could not have had a better dog’s life. I look forward to meeting you one day out on the open road at some rally or another. Thank you for being dogs best friend. I sit with tears and I know your pain and I also know the feeling of knowing you made the right choice at the right time. 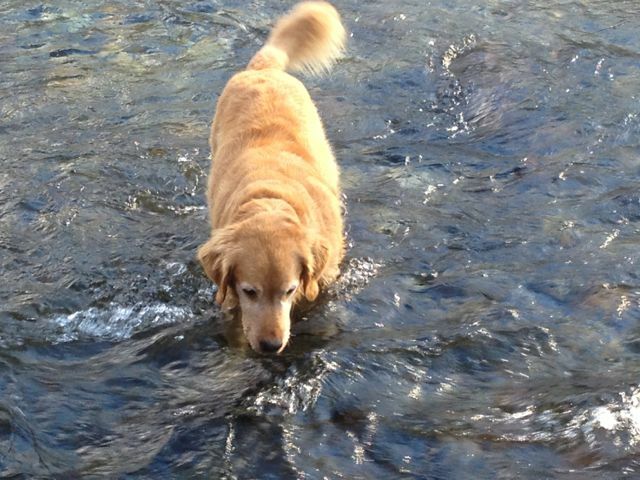 In 2014 I had to make that choice with my much loved 13+ year old golden girl, Honey on Aug. 13. And just one month and 10 days later, I had to make it once again with our our blind 7 year old great Pyrenees, Shaggy. Both had cancer…Honey–lymphoma, Shaggy hemangiosarcoma that ruptured. You boy had a most wonderful life of adventure and love. I’m surprised our paths never crossed until now. I’ve been riding with Lexie, my 12 yr old Yorkie since sometime around 2007. 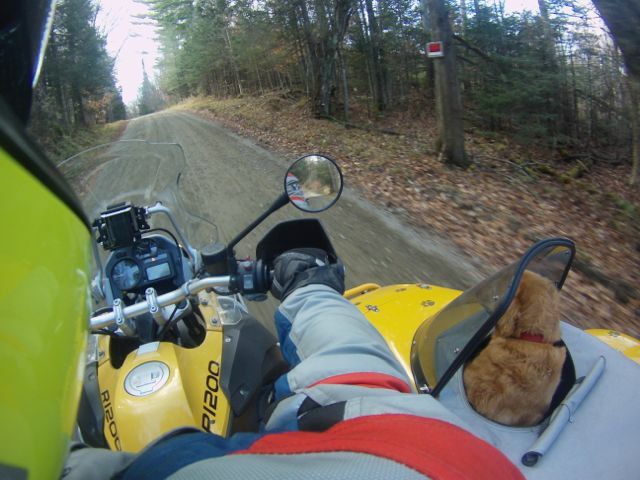 Like Barley, she’s ridden to 28 states and over 50k miles on the bike. Like Barley, she too is battling cancer right now. They originally gave her 3-6 months in February, but two major operations and a lot of chemo later, she’s still fighting the battle. It’s been a physical and emotional roller coaster. Our condolences to you and your family and may Barley rest in peace. I sit hear with tears rolling down on my face. I too am a Golden owner and have been for as long as I can remember. What a beautiful tribute, what a beautiful friend and bond you both had. You gave him a wonderful life. I have been there more than once and truly feel your pain. It’s never easy, but you made the right choice and let him go with dignity. He no longer feels the pain. I found your adventures years and always looked forward to the new ones you two experienced. I cried when I read Barley had cancer and the tears are streaming down my face again, having come the the end of the story. Barley will be missed by all of us. 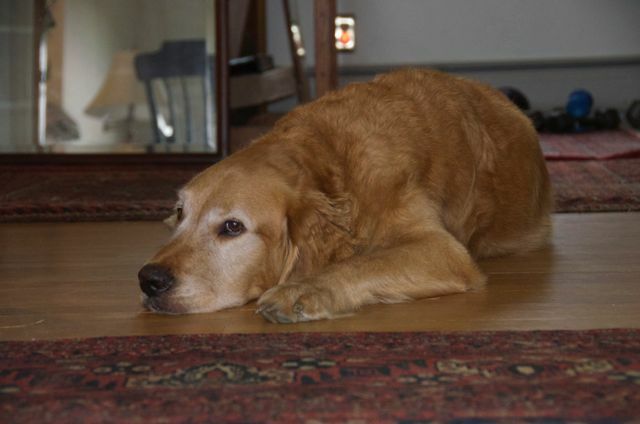 You’re in my thoughts tonight, as I travel down the highway in my 18 wheeler, with my Golden Rufus by my side. With love and gray sympathy Sabine and my faithful buddy Rufus. Sitting here with a lump in my throat still trying to figure out what to say. Man, I’m really sorry about your loss. Many times I’ve told the story about being your house guest in July and being awakened at 5:50 AM by Barley, Tulliver, and their house guest barging through the bedroom door and leaping on the bed. I had my face washed before my eyes were completely open. Now I’ll tell the same story, but the laughs won’t come so easily. What a journey it’s been for you and Barley. Thank you for sharing your wonderful adventure with me. It has been a joy to feel the connection you have with Barley. Brings me joy every time I read it! Pete – Thank you so much for sharing Barley with the rest of us. I met him during the “toasty” Sedalia BMW rally….then again at the St. Paul rally. He was a true ambassador of what being a motorcyclist is supposed to be….curious, patient, and a strong appetite for adventure. There was also that little gift he had for locating ANYONE within 500 yds who happened to be carrying an ice cream cone Heck…he even got so good that the victims just came to him instead…lol! It’s a pleasure to have met him and you, Pete. My heartfelt sympathies to you as you morn the loss of your co-pilot and soul dog. Peter I have spent time with you and Barley at Rallies, read your stories on FB, ADVRider, the YB website and here, yet overtime i have read this final goodbye, it makes me feel like i have lost a friend… just as i felt when i had to say goodbye to my favorite dog a few years ago. My condolences go out to you and your family… two legged and four. I’m sure that you are all missing Barley’s indomitable spirit. I first learned of your website while looking over some other lucky people’s two wheel adventures on ADVRider. A place, it seems, I have less time to visit these days. Having a very bright Lab, your stories caught my eye. I started following your website, dropping in from time to time, knowing changes aren’t weekly! I came to the site to see if any new fall adventures had been posted only to find you dealing with losing one of your best friends also. That touched a nerve in me also.. It seems so unfair that our devoted companions, that give us so much, have so little time to share with us. I wish you all the best in the New Year and I hope to see happy travels with Tulliver in the not to distant future…. Sorry for your loss. It’s heartbreaking and sometimes makes it difficult to think of ever owing a dog again. After many years w/o a dog, a dog came to our back door and adopted us as her family. My grand daughters say I’m Lucy’s human, rather than her being my dog. You have created a lifetime of memories and privileged us by sharing your journeys.